The final school bell has rung, the backpacks are now thrown on your foyer floor and your kids have taken up permanent residence on your couch...They have only been out of school for a day and already it looks like a tornado has run through your living room. Kick start your summer by creating a bucket list with your family. Motivate your family to come up with some fun ways to pass those long summer days. A summer bucket list can really be anything you want it to be. From simple things like having a water balloon fight to a vacation destination. Your family sets the parameters. Encourage each family member no matter how young to think of at least 5 things they would like to do this summer. Print the tag below and write each idea on its own card. Place all of the cards in a bucket or small pail. When your kids are looking for something fun to do or accomplish have them pull out an activity card and get started. My four year old and I sat down and came up with a few ideas of our own...here were her top 10! Our Summer Bucket of fun! To make a bucket like the one pictured above. 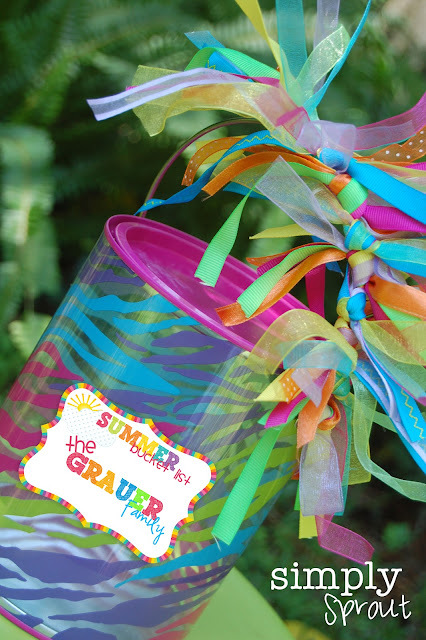 Purchase a pail ( we found ours at Hobby Lobby) and tie lots of brightly colored ribbon onto the handle. This is a great fine motor skill for your little ones to practice, getting them ready to learn to tie their shoes. 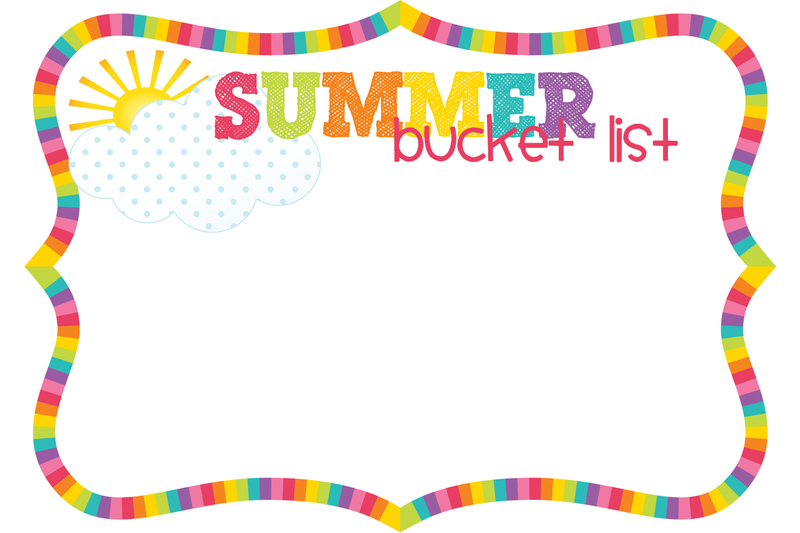 Fill the bucket up with your summer to do's and get ready to have some fun! Each time your kids are looking for something to do have them pull an activity card from the bucket. Or set a designated time each week to enjoy an activity from the bucket. If you would like to take the traditional summer bucket list a step further visit our Teachers Pay Teachers store and download our summer bucket list pack. In it you will receive printable tags and lists to help you create your bucket list as well as journaling pages for your older children (first grade and above) You can print these pages and have them bound at your local copy store so your child will have a journal they can keep for all of their adventures over the summer. Encourage them to write about their experiences after completing each item on their list. Found you on Classroom Freebies, now your follower. Very cute activity, love the frames! These are fabulous!! Love love your bucket list! I'm now a follower! Thanks for joining us! Be on the look out for more ideas each week!